From the The Big Bang Theory collection by Bif Bang Pow!. 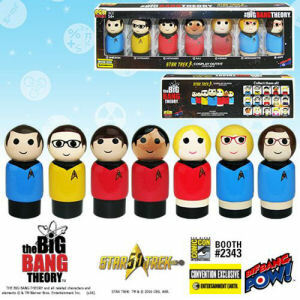 The Big Bang Theory / Star Trek The Original Series Pin Mate Wooden Figure Set of 7 - Convention Exclusive. From the The Big Bang Theory collection by Bif Bang Pow!. The Big Bang Theory / Star Trek The Original Series Pin Mate Wooden Figure Set of 7 - Convention Exclusive. Each boxed set in this limited edition run is individually numbered with a holographic sticker. Limited to 1504 sets. Bif Bang Pow! The Big Bang Theory Figurines shipping from Canada. No Surprise Border fees or Customs!